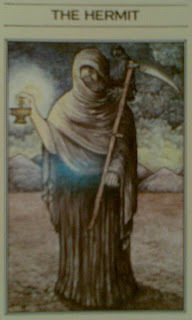 The card is from the Mythic Tarot. According to the book by Juliet Sharman-Burke, the card personifies Cronos. Time. Yes, TIME himself. 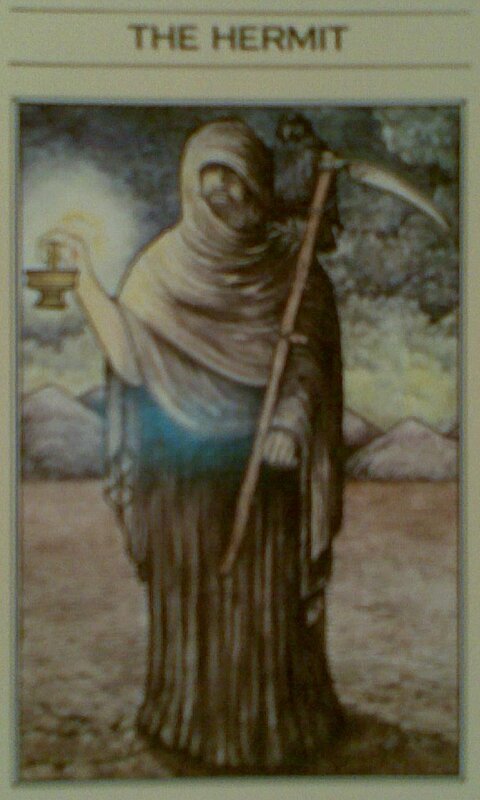 The card reminds me that some things have to end, they cannot live beyond their times. At the same time, it also reminds me that there are other things that will remain unchanged, beyond the passage of time. Conventionally, the card signifies the need to look inward, to introspect, to take a pause, to look for that light which one may have ignored all these days, that light which might show where the end of the tunnel lies. I stand at a crossroad in life where I must let go of many things which I valued dearly. Those which I chased like mad. They might not just BE. Why, I even mortgaged many other basic things just to get those elusive temptations become real. Cronos has a crow perched on his ominous scythe. In Marathi folklore, a crow is said to predict the future. It also is said to predict a visitor around the corner. Is this visitor a stranger? Or is it Time himself, who is coming around to remind me that time is one resource that is always limited. I can choose to use it properly or waste it. Wasting it is what I have done for the past six months. Complete, total, abject, unforgivable waste of time.